I’d wanted to go to Hearst Castle ever since seeing it from Hwy 1 while passing by on a road trip. The scale of the place blew my mind as I drove past and it dominated the mountaintop scenery. On a recent venture from San Francisco to SoCal for a visit to my girlfriend’s family, we decided to make it into a short side trip and stayed in San Luis Obispo one night on the way down. There are several tours available and we chose to do the garden tour since it had a pretty good variety of the things that you got to see including the insides of guest houses, both pools and the wine cellar. If you’re a photographer, keep in mind that monopods are not allowed, contrary to things that I’ve seen on the official web site (look near the bottom). Also, commercial photography is not allowed, so the images here are not available for purchase unlike the other images in my gallery. Overall, the tour was great and we got to see a lot of the grounds while getting an insight into the time that Hearst spent here. As soon as we left we were already planning which tour we wanted to take next time. In fact, there is a seasonal night tour that should be starting pretty soon! 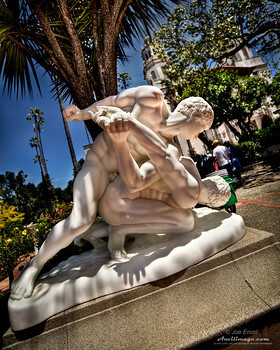 HDR Info – The Wrestlers: Shot hand held with a Canon 5D mkII through a Sigma 15-30mm lens (15mm). The base exposure is 1/500 @ f3.5 with ISO 100 and the bracket was spread at 0,-2,+2. Images were combined in Photomatix, cleaned up with layered exposure blending in Photoshop CS4, and final adjustments were made in Lightroom 3.2. HDR Info – Blue Light Special: No monpods allowed and a little too dark for hand-held HDR without cranking up the ISO really high (although it’s not really a problem! ), so I set my camera under the railing on the stone flooring next to the indoor pool to grab three shots for this HDR. Canon 5D mkII through a Sigma 15-30mm lens (15mm, ‘natch!). Base exposure was .5 sec @ f8.0 with ISO 320 and the bracket was spread at 0,-2,+2. Images were combined in Photomatix, cleaned up with layered exposure blending in Photoshop CS4, and final adjustments were made in Lightroom 3.2. 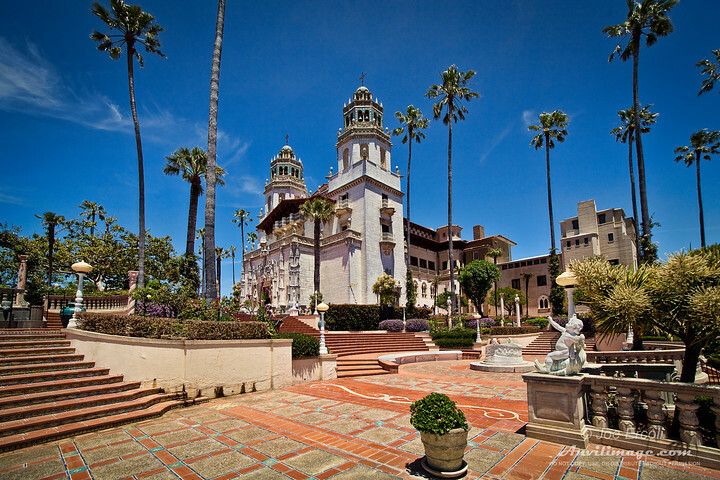 This entry was posted on Friday, September 3rd, 2010 at 2:32 pm	and is filed under Blog, Photos and tagged with central california, central coast, hearst castle, landmark, san luis obispo, SLO. You can follow any responses to this entry through the RSS 2.0 feed. Blue… Light…. Special!…. Dopeness. Great shot. BTW, what were you doing in my backyard? My wife and I visited Hearst Castle a few years back and it was quite the experience! There are so many gorgeous spots that would make for great portrait backdrops! I really like your framing and composition on the Neptune’s Nook and Blue Light Special photos. That Sigma lens you’re using seems to have some great color renditions. I also like your HDR work as well!